We had a birthday party to go to this weekend and I needed something to hold the gift, a necklace and earrings, because the place where I got the stuff didn't provide a good container. So being the paper geek I am I turned to my trusted stash and set to work. 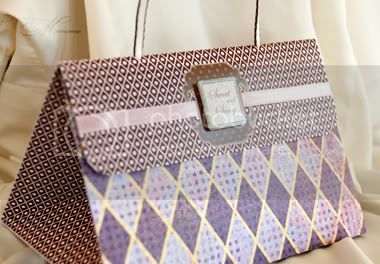 The finished product was a sassy little thing, a purple purse with brown and pink details. I also made a matching card to write a sentiment to the birthday girl. Making a purse is really easy! Use three pieces of paper, one that is the front, bottom, back and lid, and two that form the sides. The two sides must have the same width as the bottom and the same height as the front and back. 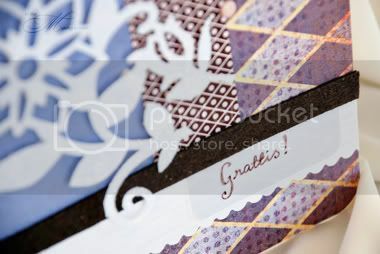 It's a great idea, I think, to use different papers for the sides. Decide what dimensions are needed. I made my purse above wide but not too high for the jewlery to fit but still be easily accessible. 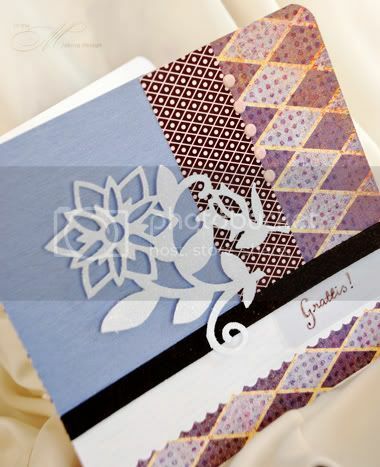 Remember to add a bit of extra paper on each side of the side pieces that can be folded in. This is where you put the double sided tape to put the pieces together. Cut the three pieces to fit your desired size and use a bone folder to mark where to fold. Make an upside down Y fold on the two sides, for the bag to close easier, before putting the whole thing together. Make two holes in the top fold and tie a ribbon or string to make the handle. Add details to make it pretty. Fill with whatever and close with low tack double sided tape. 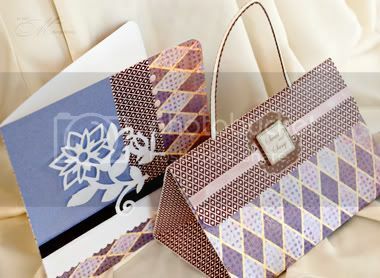 The paper purse is so cute.